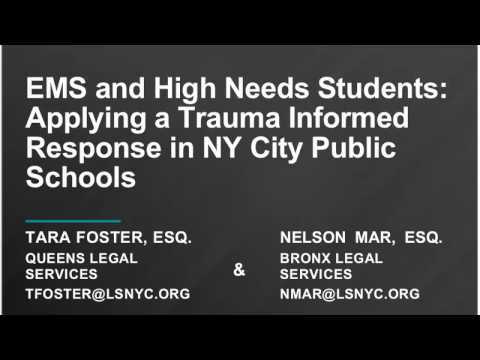 Tara Foster and Nelson Mar, Senior Attorneys from Legal Services NYC discuss how the trauma informed perspective influenced a landmark settlement on December 15, 2014. Eleven families filed suit against the City of New York in the hopes of ending the “EMSing” of disruptive students to local emergency rooms when no medical emergency existed. This webinar discusses the history of this practice and the genesis of the lawsuit and the steps the City, the DOE and the FDNY will take to curtail this practice including: the provision of crisis de-escalation training; the disclosure of data; the implementation of a new regulation regarding crisis de-escalation; and the placement of additional resources at high needs schools.